Hiking on the 1871 trail, heading south from Pu’uhonua o Hōnaunau National Historical Park, I came on this scene. 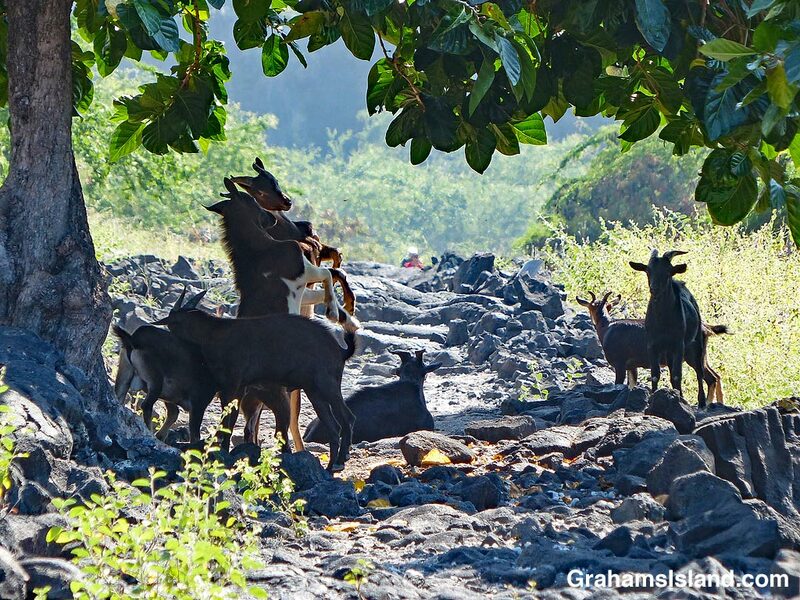 A herd of goats blocked the trail. They watched me from the shadows. Two of them raised themselves onto their hind legs and repeatedly butted heads. In the deep shade of the trees they carried the look of a gang of brigands, ready to relieve hikers of their valuables or, more likely, since they’re goats, something to eat. That could be just about anything from a carrot to the hiker’s shoes. 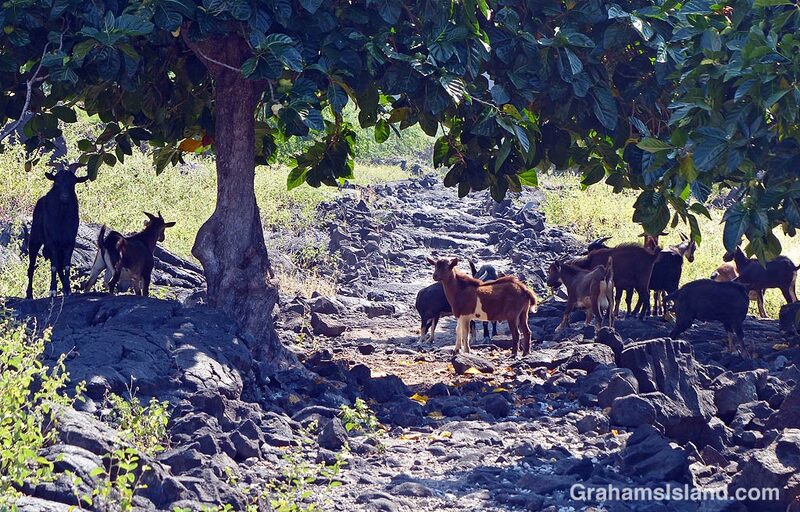 As I got closer, the goats filtered into the trees and scrub, disappearing from view. Perhaps next time I won’t be so lucky. For more information about the 1871 Trail, and other hikes on the Big Island, go to bigislandhikes.com. Posted in response to this week’s WordPress Photo Challenge, ‘I’d rather be…,’ because I’d rather be hiking. By the way, my daughter, EllaHarp, flies Sunday to Oahu for a 2-week visit and is opening, with her harp and vocals, for an Irish band at two Irish pubs in Waikiki :)) Yahoo!!! I think I’ve done my Oahu trip for the year, but I hope her shows go well. I do like goats, but I’m very respectful of their potential to be aggressive. All animals come to that. A mongoose, with young I think, growled at me today and I was off like a shot!